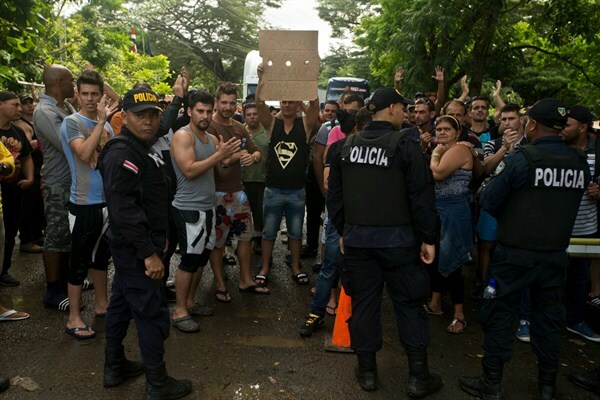 Cuban migrants at the border between Costa Rica and Nicaragua,, Nov. 16, 2015 (AP photo by Esteban Felix). Amid the wave of migrants fleeing to the United States from El Salvador, Honduras and Guatemala—collectively referred to as Central America’s Northern Triangle—another migration crisis is unfolding farther south. The Central American isthmus is increasingly becoming a pressure point for migrants from around the world, whether Cubans attempting to reach the U.S.-Mexico border via a circuitous route that begins in Ecuador, or migrants from Africa and South Asia who have been shut out of Europe and look instead to entry points in South America that lead north. The influx is not only straining the resources of countries in southern Central America, but has also raised tensions as neighbors attempt to control their own borders.